BOUGAINVILLE, LOUIS-ANTOINE DE, Comte de BOUGAINVILLE, army officer; b. 12 Nov. 1729 in Paris, France, son of Pierre-Yves de Bougainville, member of the king’s council and notary at the Châtelet, and Marie-Françoise d’Arboulin; m. 27 Jan. 1781 Marie-Joséphine de Longchamps-Montendre in Brest, France, and they had four children; d. 20 Aug. 1811 in Paris and was buried in the Pantheon with full military honours on 3 September. Like all young men of good family in his time, Louis-Antoine de Bougainville received a sound classical education; he showed a particular aptitude for mathematics, which he first studied under Alexis Clairaut and Jean Le Rond d’Alembert. In 1754 and 1756 he published a Traité de calcul intégral in two volumes which won for him the patronage of the Comte d’Argenson, minister of War and member of the Académie des Sciences. 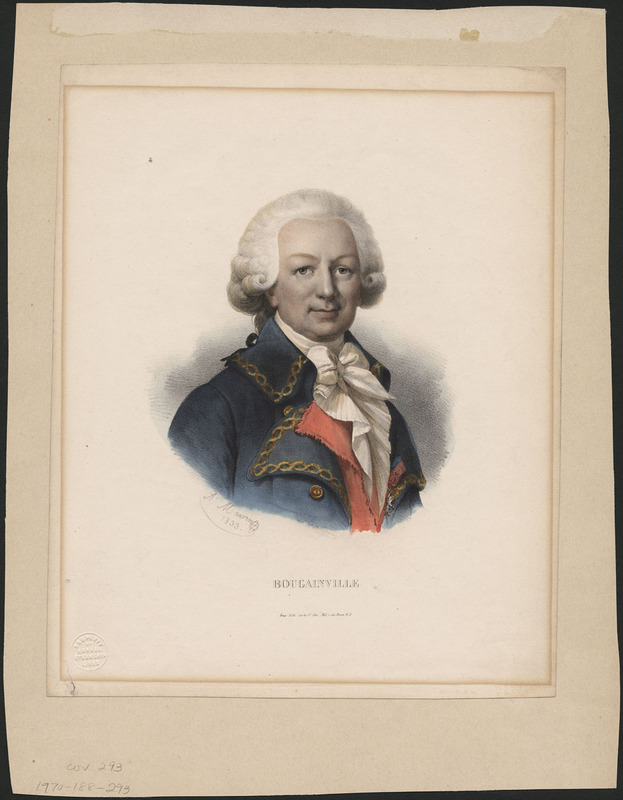 In 1750 Bougainville enlisted in the Mousquetaires Noirs; he was then 21 and rather old to enter the military profession. Three years later he became adjutant in the Régiment de Picardie. 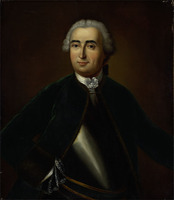 He was recommended to General François de Chevert and served as his aide-de-camp in 1754 before going to England in October as secretary to the Maréchal de Lévis-Mirepoix, who had been named ambassador extraordinary to the court in London following incidents in the Ohio valley [see Ange Duquesne* de Menneville]. 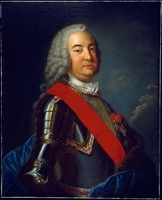 After returning to France in February 1755 Bougainville was promoted lieutenant in the Régiment d’Apchon and resumed his service with Chevert. On 12 Jan. 1756 he was elected to the Royal Society of London. 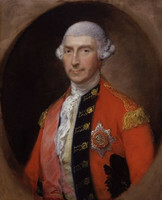 He received a commission as captain on 27 February, and when Louis-Joseph de Montcalm* was promoted to command the French regulars in Canada, Bougainville was attached to his service as aide-de-camp. They sailed from Brest aboard the Licorne on 3 April. The French and the British were again at war in North America, and Bougainville, who had no combat experience, took an active part in the military campaign. 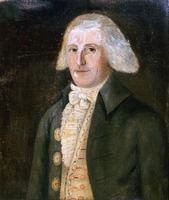 In July and August 1756 he participated in the attack on Oswego (Chouaguen, N.Y.) and its capture, which secured control of Lake Ontario for the French. His conduct earned warm praise from Montcalm, who recommended him to the minister: “You would not believe the resources I find in him. He is capable of giving a good description of what he sees. He exposes himself readily to gunfire, a matter on which he needs to be restrained rather than encouraged. I shall be much mistaken if he does not have a good head for soldiering when experience has taught him to foresee the potential for difficulties. In the mean time there is hardly a young man who, having received only the theory, knows as much about it as he.” Montcalm hoped to see his aide-de-camp enter the Académie des Sciences. 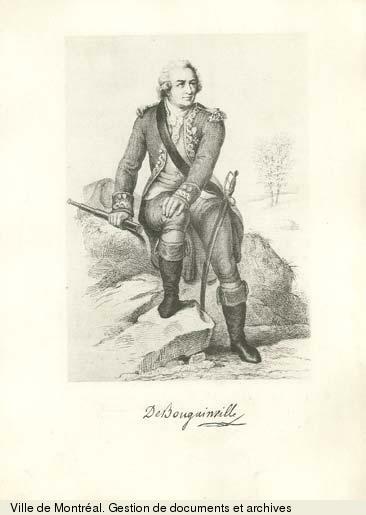 In September 1756 Bougainville scouted the British positions in the key Lake Champlain sector, which Governor Vaudreuil [Rigaud*] was considering attacking to neutralize the threat from this direction. 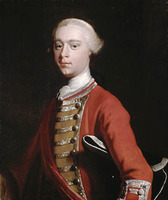 In August 1757 he took part in operations in the region and was chosen by Montcalm to carry to Vaudreuil the news of the surrender of Fort George (also called Fort William Henry; now Lake George, N.Y.), a clear victory that Montcalm did not know how to exploit fully. Bougainville’s participation in the Lake Champlain operations did not keep him from preparing plans for an attack against the British establishments on Hudson Bay which was to be conducted with four ships of the line, a frigate, and troops from New France. In contrast to the objectives that Jean-François de Galaup*, Comte de Lapérouse, would achieve in 1782, Bougainville’s plan called for permanent occupation, not a destructive raid. To ensure the success of the undertaking he wanted to obtain the assistance of Gabriel Pellegrin*, deputy port captain, who was a great expert on Canadian waters; however, circumstances prevented the plan from being carried out. In July 1758 Bougainville, fighting at Montcalm’s side, was wounded in the battle of Carillon (near Ticonderoga, N.Y.), which ended in “overwhelming defeat” for the British. None the less, the French victories scarcely touched the enemy’s military strength; the gravest menaces still loomed over the colony, and Vaudreuil and Montcalm continued to differ on the measures to be taken to meet them. In September 1758 Vaudreuil and Montcalm decided that they would send an officer to France to announce Montcalm’s victory, report on the lamentable state of the colony, and ask for aid. Their choice fixed on Bougainville. But knowing that he was wholly devoted to Montcalm, Vaudreuil also sent Major Michel-Jean-Hugues Péan*. Bougainville sailed from Quebec aboard the Victoire on 15 Nov. 1758 and landed at Morlaix, France, early in 1759. It was probably during the crossing that he wrote the four reports he gave to Berryer in which Montcalm’s pessimistic views, sometimes made even gloomier, are conveyed. One of them set out the colony’s needs in men and material. It mentioned the absence of guns and munitions, stating that in Canada there were only two engineers, eight artillery officers, eighty-six gunners or bombardiers, and no sappers or artillery or engineering workers. Appreciably overestimating enemy forces, Bougainville noted that “10,000 men lacking ammunition and supplies, have to defend three virtually unprotected frontiers against at least 60,000 [who are] in a position to attack all three simultaneously because of their heavy numerical superiority and abundant means of every sort. . . . It seems to me therefore that the court should treat Canada today like a sick person whom one sustains with stimulants, that is, should send only what is absolutely necessary for a prolonged defence.” Among the absolute essentials Bougainville included four ships that could make the defence of Quebec easier. He also advocated that batteries be built at Gaspé, Pointe aux Bouleaux on the north shore of the St Lawrence, Île aux Coudres, Cap Tourmente, Île d’Orléans, and Pointe-Lévy (Lauzon and Lévis); as well, he seemed to have a high regard for the “mobile redoubts,” boats armed with a cannon, which were the brain-child of Louis-Thomas Jacau* de Fiedmont. He also took advantage of his audience with Berryer to denounce Bigot*’s administration. Having been promoted colonel and knight of Saint-Louis, Bougainville on 28 March 1759 sailed from Bordeaux on the Chézine and landed at Quebec on 10 May. He had not, in the end, obtained much for the colony. His arrival, heralding the advent of reinforcements, “put fresh heart into an entire people who during one of the harshest winters had been reduced to a quarter-pound of bread and a half-pound of horse meat” a day, and occasioned general rejoicing, which turned out to be short-lived. Although more than 20 supply ships had reached Quebec at the same time as the Chézine, France had not considered it expedient to send more than 300 men to prop up the imperilled colony, or to defend it further, following Bougainville’s advice in this regard. 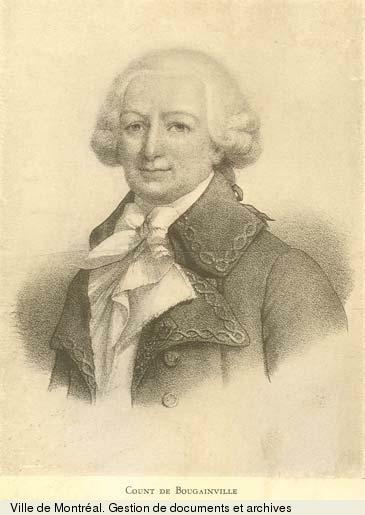 Soon after his return Bougainville left with Anne-Joseph-Hippolyte Maurès* de Malartic to reconnoitre defensive positions around the town, and in June 1759 he took command of the camp at nearby Beauport. On 27 June the British landed on Île d’Orléans, on 29 and 30 June at Pointe-Lévy, and then on 9 July at Montmorency. After the fighting on 31 July when the British unsuccessfully attacked the camp at Montmorency, Bougainville, with the 500 men under his command, was given the mission of guarding the communications between Quebec and Montreal and ensuring that the supply routes to Quebec were not cut off. Thus he followed the movements of the British fleet up to Pointe-aux-Trembles (Neuville); here on 8 August he twice repelled attempted landings. On 17 August he drove back a force disembarking at Deschambault, and later he prevented the British from landing at Saint-Augustin. But on 13 September the British succeeded in getting a foothold at Anse au Foulon, which was ill defended by Louis Du Pont* Duchambon de Vergor. Surprised to see the enemy troops so close to Quebec, Montcalm then committed serious errors, among which were failing to give Bougainville orders to trap James Wolfe* between two fires and neglecting the basic principle of concentration of force. Because of poor communications Bougainville, whose troops, brought up to 1,200 men, were widely strung out along the St Lawrence, found it impossible to assemble his men and take part in the battle of the Plains of Abraham. After the surrender on 18 September he went to take up a position in the direction of Saint-Augustin and came back to Quebec to negotiate an exchange of prisoners and settle the fate of the sick and wounded who had been left behind in the hospital. 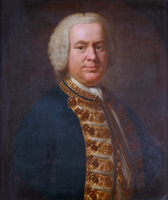 During the winter of 1759–60 he directed operations to harass the British garrison of Quebec until Vaudreuil sent him at the beginning of March 1760 to command the Île aux Noix sector on the Richelieu; here the situation quickly took a tragic turn because of desertions and the defection of the Indians, who went over en masse to the British. On 22 Aug. 1760 an attack by William Haviland* was repulsed, but on 27 August Bougainville had to evacuate the area, with the troops retreating through a wooded area, leaving only an officer and 30 men to protect the wounded. He was reprimanded by Bigot for this action. On 7 September he acted as a messenger between Vaudreuil and Amherst* in the negotiations for the surrender of Montreal. The town was defenceless and full of refugees who begged Vaudreuil to save their lives and belongings. Bougainville was taken prisoner along with the rest of the army and returned to France. Bougainville’s career in New France has been diversely judged. 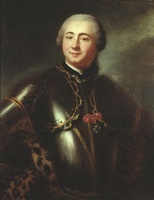 François de Lévis* had a low opinion of him and considered him a poor soldier. Some historians have held that he was partly responsible for New France being abandoned by France, and also for the defeat on the Plains of Abraham, because at that point it was he who was in charge of the defence of the shoreline beginning at Anse au Foulon. However, since Bougainville in this period had not assumed a post with great responsibility and was only carrying out orders, these judgements are too severe. Not long after Bougainville’s return to France an expedition against Brazil was being mounted, and there was some thought of entrusting command of the troops to him, but the signing of peace put an end to this project. Then he contemplated creating, with the help of Canadian refugees, a new colony that would make up for the loss of New France. The Duc de Choiseul, who had become minister of Marine, encouraged this endeavour. 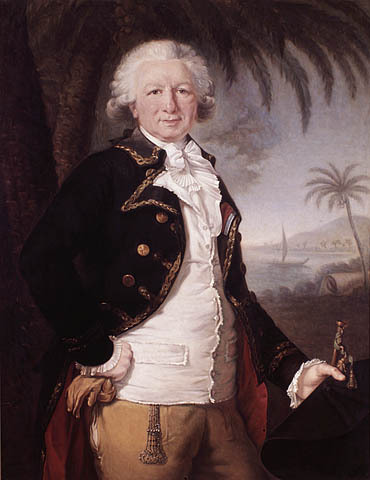 On 15 June 1763 Bougainville was appointed a naval captain and on 22 September he set out from Saint-Malo, France, with the Aigle and Sphinx to found a colony on the Îles Malouines (Falkland Islands), where he landed on 3 Feb. 1764 [see Antoine-Charles Denis* de Saint-Simon]. The court of Madrid naturally took umbrage at this incursion into what it considered its own preserve, and the islands had to be ceded back to Spain. In the mean time Bougainville had conceived the project of a voyage of exploration and discovery around the world, which immediately received Choiseul’s approval. On 5 Dec. 1766 he sailed from Brest on the frigate Boudeuse for an expedition that was to last 28 months and that would take him to Montevideo (Uruguay), to the Îles Malouines, which he ceremonially handed back to Spain, and then to Rio de Janeiro, Brazil, where he was joined by the flute Étoile, under François Chenard de La Giraudais. After calling in again at Montevideo the two ships sailed through the Strait of Magellan, where they made contact with the so-called Patagonian giants, and then crossed the Pacific, making a stop at Tahiti that created a great literary and philosophical stir; over the following years, the Tahitian visit inspired a good many works claiming to demonstrate the superiority of “savage” over “civilized” society. After exploring the New Hebrides (Vanuatu), the Solomon Islands, New Ireland, and the north coast of New Guinea, Bougainville returned to France via the Molucca Islands, Batavia (Djakarta, Indonesia), Île de France (Mauritius), and the Cape of Good Hope. He landed at Saint-Malo on 16 March 1769, having carried out, with the loss of only seven lives, the first voyage around the world by an officer of the French navy. The account of this voyage, published in 1771, met with great success and was immediately translated into English. In March 1770 Bougainville was admitted permanently into the navy as a captain, and in December 1771 he was elected an associate member of the Académie de Marine; he then examined the possibility of making a scientific voyage to the polar regions, but this project came to nothing. 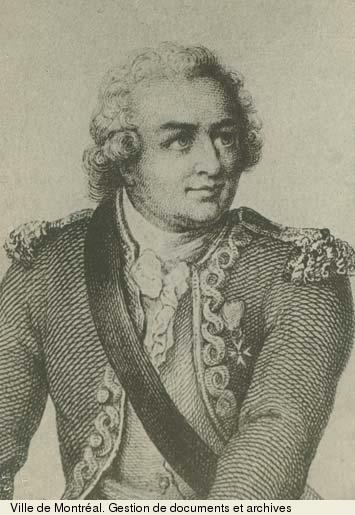 In 1775 he served as second in command on the frigate Terpsichore, in 1776 on the Solitaire, and in 1777 as commander of the Bien-Aimé in a squadron on manœuvres. In April 1778 he received command of the Guerrier in the squadron that Vice-Admiral the Comte d’Estaing was to sail to American shores and then to the West Indies. Consequently he took part in the capture of Grenada on 6 July 1779 and in the unsuccessful attack on Savannah, Ga, in October 1779. Promoted rear-admiral on 8 December, he commanded the Auguste in the Comte de Grasses squadron in 1781–82 and distinguished himself in September 1781 in the battle of Chesapeake Bay, which led to the surrender of Yorktown, Va, and the independence of the United States. In January and February 1782 Bougainville took part in the fighting at St Christopher (Saint Kitts-Nevis) in the Leeward Islands, and in its capture, and he participated in the battle of the Saintes on 12 April. His conduct on the last occasion brought him a reprimand from a court martial held at Lorient, France, in 1784. 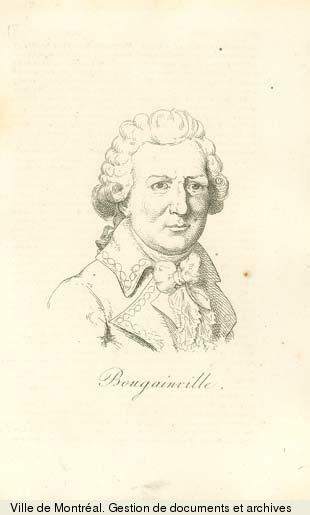 Bougainville, who had been received into the Académie de Marine as a regular member on 2 Dec. 1784 and had been admitted into the Order of Cincinnatus from the time of its foundation, became the minister’s adviser on scientific questions and in this capacity assisted in preparations for the Comte de Lapérouse’s voyage. In February 1789 he was made a member of the Académie des Sciences, and in October 1790 he received command of the Brest squadron, which he quickly relinquished because of the confusion and general disorganization associated with the French revolution. 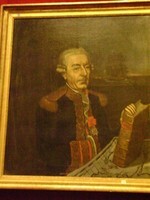 Promoted vice-admiral on 1 Jan. 1792, he resigned on 22 February and assisted the king at the time of the riot on 20 June. During the Terror he was arrested and imprisoned in Coutances; after the fall of Robespierre he was released, and on 19 Dec. 1795 he became a member of the new Institut de France. Appointed successively member of the commission to prepare the expedition to Egypt in July 1798, senator in December 1799, member of the Bureau des Longitudes, associate in the organization of Nicolas Baudin’s expedition to Australia in 1799, count of the Empire in 1808, and president of the court martial held in connection with the battle of Trafalgar, Louis-Antoine de Bougainville was laden with honours at the end of an exceptionally full career which had enabled him to develop his many talents. A brilliant mathematician, clear-headed warrior, successful navigator, and skilful diplomat, Bougainville had a mind open to all the sciences and a clear, precise style of writing. He showed himself an excellent observer of the diversity of people he encountered during his various missions and can with reason be considered a founder of modern ethnography. Shaped by an advanced culture, he was one of those who, giving at times an appearance of superficiality, combined elegance with depth. 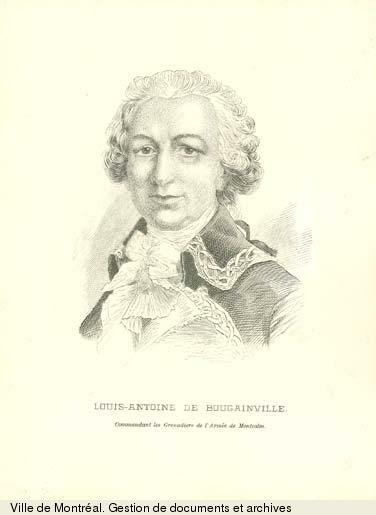 Louis-Antoine de Bougainville is the author of Traité de calcul intégral, pour servir de suite à l’ “Analyse des infiniments-petits” de M. le marquis de l’Hôpital (2v., Paris, 1754–56) and of Voyage autour du monde, par la frégate du roi la “Boudeuse,” et la flûte l’ “Étoile ; en 1766, 1767, 1768 & 1769 (Paris, 1771; réimpr., 1772, 1781; nouv. éd., Neuchâtel, Suisse, 1772; réimpr., 1773; nouv. éd., Lille, France, 1889; nouv. éd., introd. de P. Deslandres, Paris, 1924; nouv. éd., Étienne Taillemite, édit., Paris, 1977). The latter work was translated into English by J. R. Forster (Dublin, 1772) and into Spanish by Josefina Gallego de Dantin (Madrid, 1921). The manuscript “Journal de la Boudeuse (1766–1769)” can be found at AN, Marine, 4JJ, 142. His “Mémoire sur l’état de la Nouvelle-France à l’époque de la guerre de Sept Ans” has been published in Relations et mémoires inédits pour servir à l’histoire de la France dans les pays d’outre-mer, Pierre Margry, édit. (Paris, 1867), 37–84, as well as in ANQ Rapport, 1923–24: 1–70, as “La mission de M. de Bougainville en France en 1758–1759,” an article which brings together the various reports presented by Bougainville at the time of his voyage. 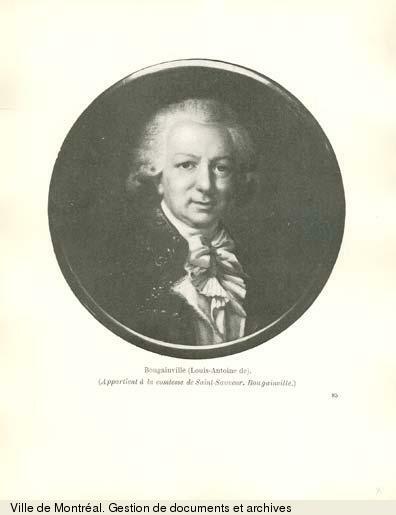 In 1964 Edward Pierce Hamilton translated and edited some writings by Bougainville in Adventure in the wilderness: the American journals of Louis Antoine de Bougainville, 1756–1760 (Norman, Okla.). Étienne Taillemite has published all the navigation journals of Bougainville and his companions in Bougainville et ses compagnons autour du monde (2v., Paris, 1977). The journal that Bougainville kept while in Canada was published by Amédée-Edmond Gosselin in ANQ Rapport, 1923–24: 202–393. AN, Col., C11A, 104: ff.184, 188–92, 200–3, 267; 105: ff.17–18; C11E, 10: ff.213–24; Marine, B4, 141–48; 152; 161–70; 192–93; 195; 205–6; 236; C7 (dossier Bougainville). Guy Frégault, François Bigot, administrateur français (2v., [Montréal], 1948). René de Kérallain, Bougainville à l’escadre du comte de Grasse (Paris, 1929); Bougainville à l’escadre du comte d’Estaing (Paris, 1927); Les Français au Canada, la jeunesse de Bougainville et la guerre de Sept Ans (Paris, 1896); La prise de Québec et la perte du Canada d’après des publications récentes (Paris, 1906). J.-É. Martin-Allanic, Bougainville navigateur et les découvertes de son temps (2v., Paris, 1964). Michèle Duchet, “Bougainville, Raynal, Diderot et les Sauvages du Canada: une source ignorée de l’histoire des deux Indes,” Rev. d’hist. littéraire de France (Paris), avril–juin 1963. 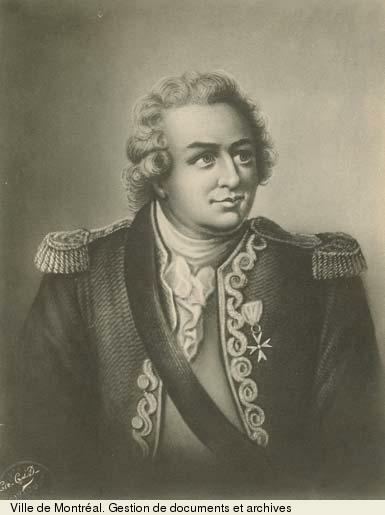 Étienne Taillemite, “BOUGAINVILLE, LOUIS-ANTOINE DE, Comte de BOUGAINVILLE,” in Dictionary of Canadian Biography, vol. 5, University of Toronto/Université Laval, 2003–, accessed April 20, 2019, http://www.biographi.ca/en/bio/bougainville_louis_antoine_de_5E.html.